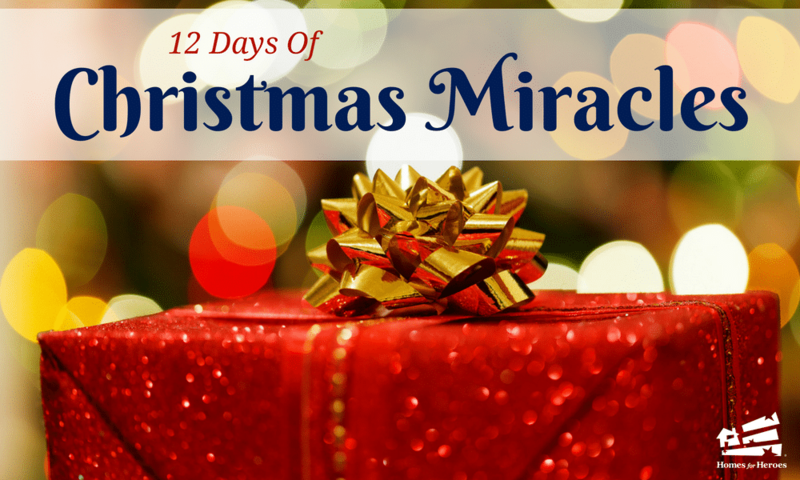 Day three of our 12 Days of Christmas Miracles was presented to a veteran family who wishes to remain anonymous. The family lives in Bismarck, ND. They have three children, all under the age of three. Despite being a 100% disabled vet and living off a fixed income from the VA, this veteran never complains about a thing. He simply takes pride in having served his country. Recently, this family discovered a leak in their bathroom ceiling. The cost to fix this leak was over $700. Homes for Heroes Specialist, Beth Posey knew this family could use extra help this holiday season, with money being tight with the unexpected plumbing expense. Beth presented the family with a gift of $500 to brighten their spirits and holidays. The gift arrived at a perfect time as they just recently over-drafted their bank account. The $500 was used to help them get caught up on their debt and past-due bills. There was even money left over to buy some presents for their children. Their children will receive doll strollers, play wagon, toddler tool set, bath toys, shoes, sweaters, shirts, and pjs as gifts on Christmas morning.